#1 The guitar fell off its stand. #2 My dog bumped the guitar as it was leaning up against our couch. #3 The guitar case just slipped out of my hands and fell to the floor. #4 I was drinking … just a couple! #5 The speaker cabinet fell on it. #6 I was being a rock star and did a Pete Townsend. #7 The guitar was in its case under my bed the whole time. #8 My kids say that they didn’t do anything. #9 Hell hath no fury like a woman scorned. And the #10 reason? I backed up over it with my car! 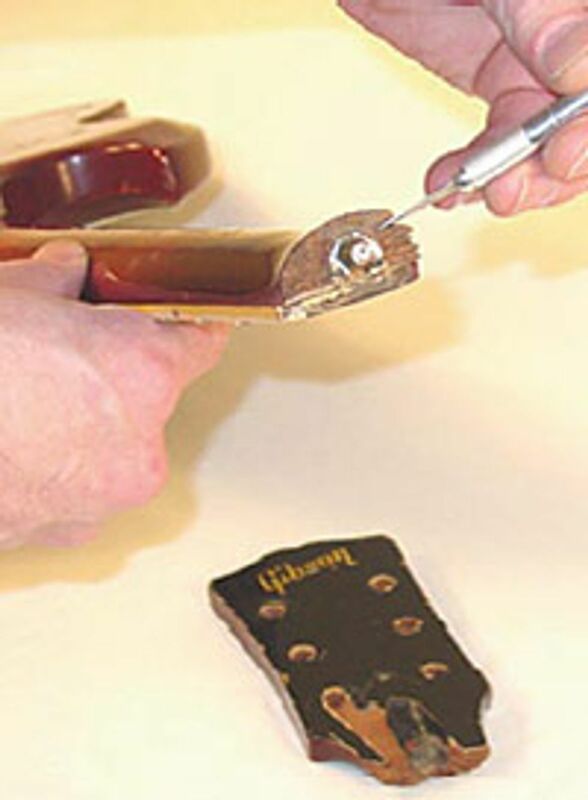 It just takes a second of not thinking and/or a moment of bad luck before your treasured guitar is in need of an extensive repair. 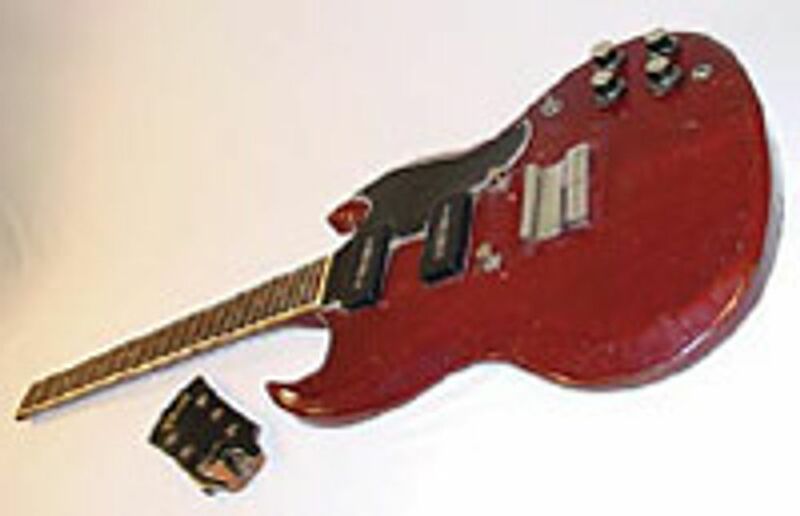 Throughout the years, I have come across a handful of people that have thrown out their guitar after this tragedy, thinking that a major break like this would not be repairable. This clean snap or break is the most difficult repair. As you can see, there is no neck wood branching over, webbing the brake together, nor is there the classic brake where it is holding on by a thin flap, the headstock face plate. There is no doubt about it – this kind of headstock brake is as challenging as it gets for an invisible repair, unless it was to come to us after being run through a wood chipper. Although, what is in our favor is that it was never previously repaired; that means we won’t have to deal with all that old glue in getting the two pieces to perfectly fit. These types of repair are what keeps the blood flowing and the mind sharp. I find that the two pieces will not go together very well, as it appears that the headstock was broken quite some time ago. I use my exacto knife and trim some of the splinters till the seam line pressure fits closed. System Three industrial epoxy will be my choice of glue. I will also be reinforcing the headstock with a couple of wooden splines that will be inlaid through the brake. It will be finished off with an aged nitrocellulose touchup. In next month’s issue, we will be highpressure clamping the headstock together with a custom fixture and routing out the neck to inlay the wooden splines. John Brown, of Brown''s Guitar Factory, is the inventor of the Fretted/Less bass.He owns and operates a full guitar manufacturing and repair/restoration facility, which is staffed by a team of talented luthiers. He is also the designer of guitar making/repair tools and accessories that are used today by instrument builders throughout the world.